So 1200 of us travelled to Elland Road to watch a promising performance against what seems like a quality Leeds United side under Neil Warnock. Even though the scoreline looks like the game was a one way game, the real story is far from that. Town started the first half really positively and came close to breaking the deadlock with Mark Wright firing straight at Paddy Kenny after a good build up which included a lovely little dummy from Marvin Morgan. But after 17 minutes of Town pressure, Leeds managed to score against the run of play after a couple of mistakes in the town box including Weale and Hector, allowing Becchio to fire in from the edge of the 6 yard box. But soon after Town were almost level when Luke Summerfield had a go from distance which Kenny was equal to. Not long after the goal that should not have stood. Hector was again caught out and after a couple of ricochets, the ball arrived to Varney, off a Leeds foot, who seemed to be a yard offside. Varney then squared the ball to Ross McCormack who only had to tap the ball in to an empty net. Town started the second half with some great passing but nothing that gave Leeds a worry. In fact Leeds could have been 3-0 up not long into the second half but Weale saved brilliantly from Leeds captain David Norris. Even though Leeds were still dictating the play, nobody could fault our fans as we were in fine voice and still out singing the Leeds fans. But no matter how close we got we couldn’t find the net, even when Paddy Kenny makes a rare mistake to allow Morgan a chance at goal but the ball flew over the net. Soon after it was 3-0 even though we think Weale should have done better after a weak shot from David Norris seemed to evade Weale and the game was pretty much over. 5 minutes later McCormack scored from a penalty after Hector, who suffered a dire afternoon, handled the ball inside the box. We were going to mention the linesman on our side of the pitch but the list of mistakes he made is ridiculous. One to note is when Kenny saved well from Morgan, but for some reason the linesman saw it as a goal kick not a corner. How? No idea. But the final whistle blew and the Salop fans stayed to applaud the players off after a decent performance against a good Leeds side. The scoreline flattered Leeds but with a catalogue of mistakes at the back, Leeds took full advantage and took their chances well. Next up is Sheffield United and hopefully Salop will learn from their mistakes and who knows we might come away from Sheffield with 3 points. @Bennn365: We need to buy a proven goal scorer. Also hopefully start Hazell over Hector, dIdn’t think much of him. @Bettfromstrett: still positive about season ahead. Some concern today on finishing and central defence but #ingtwetrust . Great support! 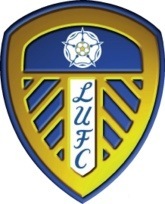 Alex has done his research and has done a little bit about Leeds and has also tried to predict what will happen on Saturday. So the long awaited first competitive match is nearly upon us and what a tie it is. LEEDS UNITED AWAY! 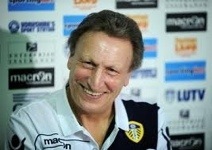 Looking back over the years and SALOP haven’t faired to well against Leeds. Don’t be too disheartened by these facts because, as we proved last season, we can cause an upset or 2 and there is no doubt in anyone’s mind Turned will get the players in the mentality that they are there to win. 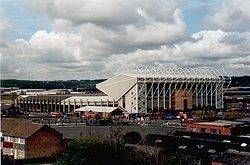 Elland Road is a very historic stadium after being home to Leeds since 1919 and is the second largest stadium outside of the Premiership behind Hillsborough. Initially the ground was the home of the Holbeck Rugby Club who played in the northern rugby union, the forerunner of the rugby football league. Away fans are housed on one side of the John Charles Stand (towards the South Stand), in the upper tier where up to 3,000 supporters can be housed. The seating is a mixture of old wooden and plastic seating, the leg room sparse, plus there are a number of supporting pillars running along the front of the upper tier which could impede your view. However the facilities within the stand are very good. Food on offer on the concourse includes; Cheeseburgers (£3.80), Burgers (£3.50), Peppered Steak Pies (£2.90), Chicken Balti Pies (£2.70) Potato and Meat Pies (£2.70) and Cheese, Onion and Potato Pies (£2.70). Leeds fans are known as the most hated fans in Britain but you can’t deny they are very passionate about their club and travel away in big numbers and good voice. The song they are most famous for singing is Marching on Together. From reports from other fans they have said the stewards are tough and will eject people without warning and in a violent manner so we suggest you should not give them a reason to approach you. Also they have told us club colours are to be worn with caution whilst your outside the stadium which is a shame if it’s true. There is the Drysalters pub which is about a ten minute walk away from the ground. On my last visit it had a good mix of home and away supporters, real ale and large screen SKY TV. To find this pub; with the Old Peacock pub behind you, turn left and follow the road down to the very end. Pass the entrances to a number of car parks and go under a railway bridge. At the end of the road, turn left along the dual carriageway and the pub is a short way down ‘tucked in’ on the left. Otherwise alcohol is served within the ground in the form of draught Becks Vier, Boddingtons Bitter and Blackthorn Cider (all £3.50 a pint), plus small bottles of red and white wine (£4). Just a few doors down from the Old Peacock pub (which is behind the South Stand and is not recommended for away supporters) is the Graveleys chippy, which does brisk business on matchdays. There is also a McDonalds outlet situated across the road from the East Stand. Well this one should be a straight answer but after last years cup exploits, I believe this could be another great moment following the mighty Salop. So we finally know who we have in the Capital One Cup. 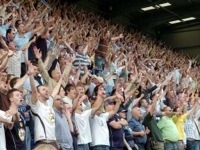 LEEDS UNITED AWAY. How many people have been looking forward to saying that. 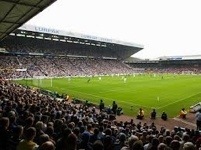 Elland Road is an iconic stadium and it would be brilliant to see blue and amber shirts and flags in the away end. 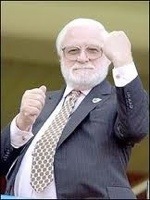 Let’s out sing the Leeds fans and back the team to another cup upset. And now we can add Leeds United to that list. We will let you know when tickets on sale. And we will find out locals for town fans to go to. So let’s get behind the boys on the 12th/13th August.